William C. Cagney litigates complex financial, commercial, and fraud cases, on trial and appeal, for businesses and financial institutions, as well as owners, shareholders, officers and directors, and partners. 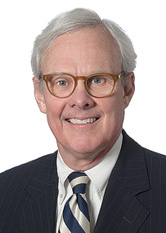 His extensive experience includes commercial disputes, white-collar criminal defense, RICO cases, shareholder and partnership disputes, and employment litigation. Mr. Cagney also advises clients on corporate compliance programs and government investigations of tax, banking, government contracting, health care, and securities fraud offenses. achieving a jury acquittal on entrapment grounds in favor of an international money manager. Mr. Cagney has served as Assistant United States Attorney and Deputy Chief, Special Prosecutions Division, in the U.S. Attorney's Office, District of New Jersey, receiving the Attorney General's Special Achievement Award and a U.S. Department of Justice Special Letter of Commendation from the Director of the F.B.I. He has also served on the Profession of Law Faculty of Columbia University School of Law, teaching professional responsibility and legal ethics. His prior appointments include Member, New Jersey Supreme Court Board on Attorney Certification, Certified Civil and Criminal Trial Attorney, and Chair of Criminal Certification Committee. He is currently a Supreme Court appointee to the Office of Attorney Ethics Project. Mr. Cagney has also served on the boards of several non-profit, educational and religious institutions. Mr. Cagney attended Regis High School in New York City.